Raumfahrt+Astronomie-Blog von CENAP - Blog: Mars-Chroniken - WHAT CAN CURIOSITY TELL US ABOUT HOW A MARTIAN MOUNTAIN FORMED? One idea is that sediment once filled Gale Crater and was then worn away by millions of years of wind and erosion, excavating the mountain. However, if the crater had been filled to the brim, the material on the bottom, which now makes up the crater’s surface, would have been pressed down. But the new Science paper suggests Mount Sharp's lower layers have much less compacted than this theory predicts, reigniting the debate about how full the crater once was. The researchers accomplished this by recalibrating the accelerometers on NASA’s Curiosity rover to detect changes in the planet’s gravitational tug as it ascends the slope. “Gravimetry can help scientists understand a planet’s interior structure,” Morrison explained. 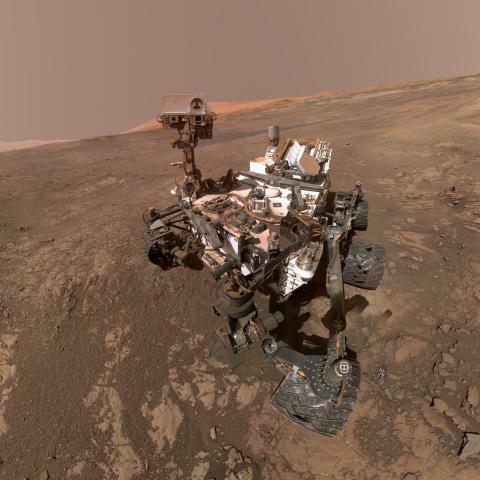 Between October 2012 and June 2017, the researchers made more than 700 such measurements using Curiosity’s accelerometers, comparing them to models of Mars’ gravity fields and to estimates of its mineral density. "There are still many questions about how Mount Sharp developed, but this paper adds an important piece to the puzzle," said Ashwin Vasavada, Curiosity's project scientist at NASA's Jet Propulsion Laboratory in Pasadena, California. JPL manages the Mars Science Laboratory mission of which the Curiosity is a part. "I’m thrilled that creative scientists and engineers are still finding innovative ways to make new scientific discoveries with the rover." Mosaic taken by NASA's Mars Curiosity rover looks uphill at Mount Sharp courtesy of NASA/JPL-Caltech/MSSS. This work was supported by Supported by the MSL Participating Scientist Program (JPL subcontract 1548315), the Mars Fundamental Research Program (NNX14AQ92G), and NASA Earth and Space Science Fellowship award 18-PLANET18R-0036.